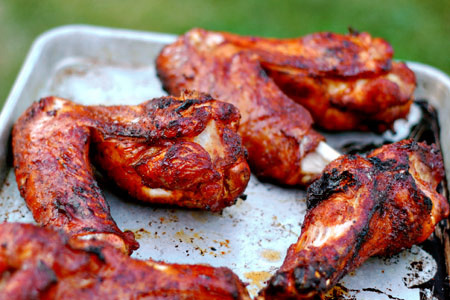 Grilled and smoked chicken wings are certainly nothing new. However, turkey wings on the grill are new to me. I've cooked plenty of turkey legs, but never wings -- until now. If you like wings, you owe it you yourself to try these. These things are huge! The pan pictured here is a half sheet pan. That should give you some perspective. We're talking about nearly four feet of smoky and sticky poultry wingspan goodness! One wing is easily enough for a man-sized meal. Not only are they seriously large, but they are seriously good, and brain-dead easy to make. I cooked mine on the Char-Broil Big Easy® Smoker, Roaster & Grill, but you can use whatever grill or cooker you have. Thanks to the good folks at Honeysuckle White for sending me these to try. I look forward to going bird-to-bird with some fellow bloggers and competing in their Take On Turkey Challenge. Using a cleaver, cut off the tip of each wing. Cut out the V-shaped web of skin from between the wing joints. 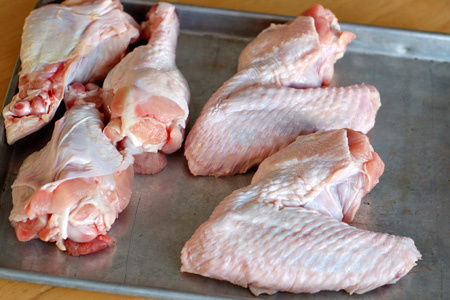 Lay the wings on a sheet pan and season each liberally all-around. Cover and let marinate, refrigerated, at least two hours, or overnight. Start your fire and prepare for indirect cooking at medium-high heat (375º-400º). Add two small chunks of fruit wood (apple or cherry) to the fire about 10 minutes before you're ready to cook. Wood chips soaked for 30-60 minutes will work well, too. If you're using a gas grill, make a smoker pouch. Cook the wings indirect until the internal temperature of the thickest portion of each wing reaches 185º (about an hour and 45 minutes). 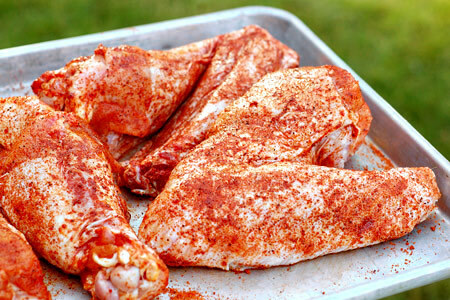 Slather each wing liberally with the sauce, tent with foil and let rest 10 minutes. we were lucky to get to try these and were so blessed. 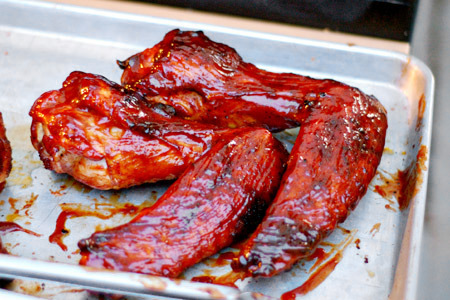 Super yummy bbq goodness. Thanks for serving our crowd.